The prayer of petition to Saint Benedict may be found here, and then pray the following prayer. God, our Father, may Saint Benedict be our special patron in heaven so that what we cannot achieve by our own merit, we may obtain through his merits and prayers and Your loving grace. We ask this through Christ our Lord. Amen. Mighty God, the source of all perfection, by the gift of Your grace, the blessed Benedict left all things that he might dedicate himself more fully to Your service for the salvation of the world. May all those, who strive to walk the path of perfection, not go astray, but run without stumbling and be rewarded by You with the gift eternal life. We ask this through Christ our Lord. Amen. Today begins nine days of prayer to Saint Benedict, ending at First Vespers of Saint Benedict’s Transitus (March 20). On March 21, many Benedictine monasteries around the world will observe the death of Benedict (+547) with solemnity, if you follow another liturgical calendar other than the Roman one, while other monasteries will celebrate July 11 as a feast, the translation of Benedict’s bones. Almighty and eternal God, may the example of blessed Benedict urge us to strive for holiness of life and, by celebrating his memory, may we be inspired to follow him in the spirit of his Rule. We ask this through Christ our Lord. Amen. 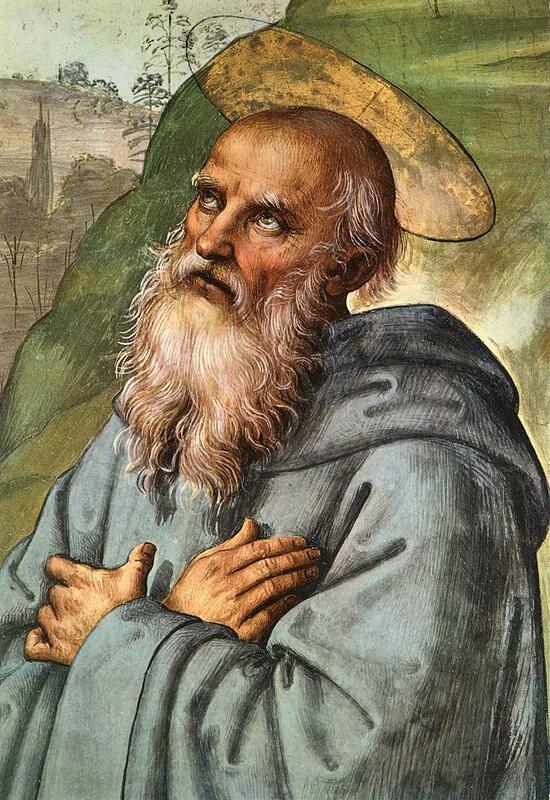 St. Benedict’s spirituality was not an interiority removed from reality. In the anxiety and confusion of his day, he lived under God’s gaze and in this very way never lost sight of the duties of daily life and of man with his practical needs. Seeing God, he understood the reality of man and his mission” (April 9, 2008). 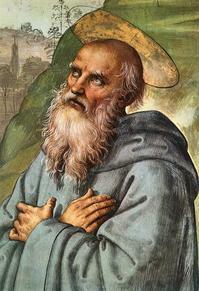 A tender word from Saint Benedict’s Holy Rule is important for all of us to reflect upon as we begin 2013. The saint is clear that the Rule is not for the holy people or for people who are well-versed in the spiritual life. On the contrary what we see here in the Prologue we read that our following (listening), our friendship with Christ is a work of which we ought to be diligent in doing if we are to reach our goal: heaven. Only in doing the hard work, some will say rightly so, doing battle, the distance between ourselves and God be lessened. Benedict is truly a father with an emphasis on mercy and honesty. His approach cultivates in all of us, I hope, a humane and reasonable way of living. What distances the self from God? The truthful assessment of our life is our personal sin, the “slothful disobedience” we engage in. Overcoming sin, by Grace, is the work of each one of us, pope to peasant, PhD-holder to high school student. All we need to do is begin. Notice the emphasis I’ve placed for your concentration. Saint Benedict of Nursia writing his Rule ~a 1929 portrait at Heiligenkreuz Abbey, Austria by Herman Nieg. true King, and are taking up the strong, bright weapons of obedience. 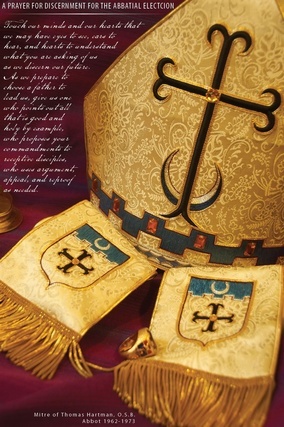 to begin the process of electing a new Abbot. Abbot Barnabas Senecal, 75, is leaving the abbatial office. The Constitutions of the American Casinesse Congregation of monks has the abbot submitting a resignation on his 75th birthday. Abbot Barnabas has served for the last 18 1/2 years. thoughts and prayers as they gather to elect a new Father in Christ. The abbey recently saw two monks profess temporary vows and three men enter the novitiate. Holy Spirit guide the hands of the monks. 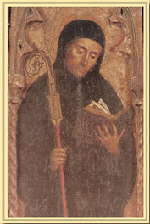 Saint Benedict, pray for the monks.